Many of us have dreamt of serving in the Peace Corps as volunteers in some faraway land, learning about a different way of life. The Peace Corps is known to be that alternative path out of the U.S. job market for many college students. But few of us know what service under the Peace Corps is really like. 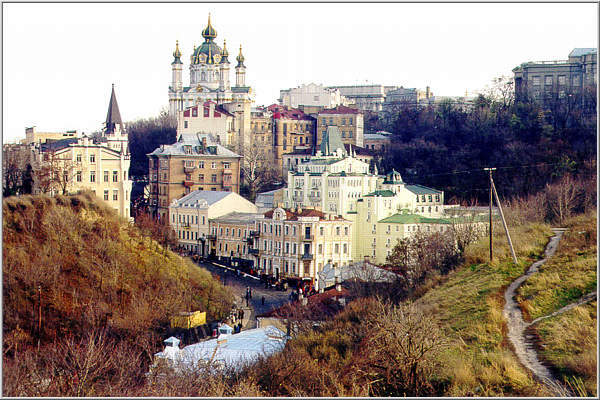 Ukraine is a nation of about 60 million people, one of the largest countries of the former Soviet Union. Its president requested aid during a meeting with then-president George Bush in 1991. As part of the response our nation sent Peace Corps volunteers; first business teachers, then English teachers. The first volunteers were expected to arrive within six months, so no sites were checked out for health conditions, according to Dr. Donald Stainsby, a Peace Corps medical official. Stainsby later collected information from Ukrainian authorities at four such sites. This information proved to be so poor the final version of the report stated that it was neither scientific nor comprehensive. Still, the first wave of volunteers was placed at various sites within Ukraine, the site of the Chernobyl blast that contaminated much of Western Europe. Locations like the capital city of Kiev are less than 90 miles from the site. Americans were placed in some of the most polluted areas in Ukraine, like Dnepropetrovsk. Dnepropetrovsk, once an industrial giant, contains more than 20,000 radiation sources alone, according to a Russian Press Digest article. The railway into the city was used to ship radioactive materials in open cars. Railyard workers receive a special job classification because they receive up to 240 microroentgens an hour from the ground alone, compared to the 12 per hour we ``normally'' receive. According to Stainsby, the contamination of air and water is even more life-threatening. Leukemia, thyroid cancer and genetic defects are skyrocketing in Ukraine. Child cancer rates have risen nearly 80 percent in neighboring Belarus. Ukrainian inspectors lack necessary instruments, and must therefore eyeball smokestacks. The factories simply dump the pollutants at night. The water is so poisoned every volunteer is given a steam distiller. The local foods are unsafe and rarely inspected for residual contamination, so clean food is only available from import stores. And radiation is seeping into groundwater, saturating everything. The volunteers are not informed of the specific risks to their health because the Peace Corps cannot determine how bad the situation is without significant independent testing. The Peace Corps uses the data, and the subjective judgments, of Ukrainian officials, who in turn rely on standards more permissive than those accepted in the United States. The risks are obvious. The Peace Corps dealt with the possible threats to volunteer health with relative nonchalance. The initial assessment of March 1993 took no environmental samples. The report stated that volunteers like those in Dnepropetrovsk may suffer respiratory illness, cancer, kidney damage or miscarriages. The reference materials Stainsby requested regarding radiation and pollution never arrived. Despite the recommendation of constant monitoring for health problems, the Peace Corps in Ukraine has lacked a doctor on its staff since Stainsby left in July. Despite his recommendations for immunization against rabies and hepatitis B viruses, the Peace Corps refused to provide them. But there is more. Take security for example: Some volunteers are placed in remote areas without adequate police protection. The phone system is notoriously poor and simple calls may take an hour to make. In case of emergency or country evacuation, there is just a single phone line for 68 volunteers. Volunteers in Moldova and Ukraine have been beaten and sexually harassed; a volunteer was raped. The security officer suggests that such cases be reported to the local militia (not known for its crime-fighting fervor) and to the U.S. Embassy, but volunteers are forbidden to carry Mace. Volunteers are dissatisfied with the support they receive from Peace Corps Ukraine. In a survey conducted by the volunteers themselves, only 18 percent thought the country's director managed resources effectively. Only 35 percent believed they received adequate support from the Peace Corps. One associate country director received a mere 17 percent approval rating by volunteers. Volunteers complain bitterly of the lack of books, advice or even contact from their administrative office. With 22 full-time staff this office has one paid staff for every three volunteers, but some have not received even a phone call or visit after four months. The point is not the information the Peace Corps gives volunteers, but the facts left out. American citizens are put at grave personal risk for a mere $150 a month (current salary in Ukraine). At the very least, they should be allowed to make informed decisions about service. Ideally volunteers should receive the full benefit of the multimillion-dollar budget allotment, and their rewards should be commensurate with their sacrifice. Anything less is the exploitation of the admirable intentions of college students for political aims. Brian DeBauche is Worldviews editor for The Daily and recently returned from Ukraine. This article in the link above was originally written in 1994. We have been informed by current volunteers that much of the information is out of date and no longer applies. We are leaving the original link because one of the purposes of this site is to be a historical archive of peace corps information. Much of the article by Brian DeBauche is now ancient history, however Ukraine is still a difficult assignment (clinical depression of nationals as well as PCVs is very common). I personally suspect many environmental problems still exist and PCVs are assigned in very polluted areas (air, water, food). I placed a verbal complaint with the medical staff in Kiev and was informed that they were not responsible but Washington "inspectors" handled environmental problems associated with assignments. The current country director is a spy master seeking to expell volunteers for "illegal" travel. Peace Corps allows only two days vacation per month. Vacation includes any overnight absense from your assigned location. Thus, a Saturday night absense requires approval from your "regional" director and one vacation day credit. The country director seeks to enforce such a ludicrous plan by "administratively" separating many good volunteers who want to see more of Ukraine outside of their assigned location (site). Budu priznatel'na za lubuyu informatziu o svodnom brate Bikove Borise . Data rozshdeniya 15 maya 1962 goda. Prozshival v Dnepropetrovske. I'll appreciate any information re. my half brother Bikov Boris. Date of birth: May 15, 1962. He lived (maybe nowdays live too?) in Dnepropetrovsk. Sincerely, Faina Portman. May 6, 2007. Proximity to radioactively contaminated sites is worrisome. Government and Peace Corps Director uninvolvement and even possible interference is even more disconcerting. However, the above information is quite old. Does anyone have any more recent experiences? Please feel free to email or call. Toll free 888-456-7447. I am from Canada and have lived in Dnepropetrovsk 2008 for 2 weeks, 2007 for 6 months and 2006 for 8 months and 8 months in Lvov in 2005. I lived in a houses with a Ukrainian families and enjoyed my stays very very much, living as a local, eating local produce and walking miles, riding the trams and buses all over the city. I had a wonderful time and enjoyed my visits immensly and slimmed down and put on muscle from all my walking and natural farm food that we where able to purchase from local makets. The worst food was obviously Western Junk Food from McDonalds and Other Western Resturants Chains. Adult people there understand that this food is unhealthy and junk so most stay away but the youth think it is trendy as are cheap cigarettes and cheap booze. I speak Russian so that allowed me complete access to all local activities and citizens and would recommend that Western society probably adds more harm with their programs as the western society thinks their programs are progressive when infact they are complete junk including Western Politics and Western Business as the present dissaster in the west, especially USA, illustrates today and most countries would definitely be much better if western propoganda stayed home.